Kinshasa 07-02-2019 Politics - Today, the Kenyan stage of the visit of the Head of State has a symbolic dimension when thing doesn’t move well between CACH and Lamuka. It is therefore time that the Congolese political class consolidates this momentum of reconciliation to prevent this country from sinking into the abyss. Became head of state, Felix Tshisekedi found the country that he inspired on the path of national reconciliation. Since Tuesday, February 5, President Félix Antoine Tshisekedi has started his first round abroad, since his investiture on Thursday, January 24th in Kinshasa. Started by Angola, this journey continues in the countries of the region. While in Kenya yesterday Wednesday, February 6, the Congolese head of state honored this country that saw the birth of the Coalition for Change (CACH). Platform that brought to power the ''Fatshivit tandem''. The first trip of the new Congolese President to the country of Uhuru Kenyata is a symbol. 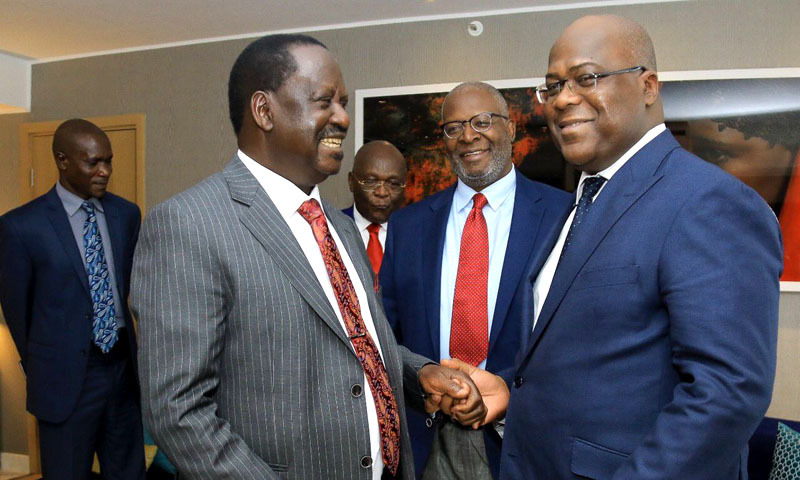 It was in Nairobi in fact that Felix Antoine Tshisekedi and Vital Kamerhe sealed their union on 23 November 2018, following their renunciation of the Geneva Agreement which they signed on 11 November. In the midst of a bloody war between President Uhuru Kenyatta's supporters and his opponent Raila Odinga at the end of the August 4, 2017 presidential election, Kenya had a bleak time before the reconciliation wind blows. It is this haven of peace that has undoubtedly inspired the two presidential candidates in the DRC, Felix Antoine Tshisekedi and Vital Kamerhe. Deciding to withdraw his candidacy from the race to the highest office, the president of the Union for the Congolese Nation (UNC) preferred to let the way to the new president of the National Union for Democracy and the Social Progress (UDPS), so that he can carry high the standard of '' Mupepe ya sika '' (the new wind), in the name of the '' Fatshivit ticket''. Fate will smile them on January 10, 2019 at 3:15 am when the President of the Independent National Electoral Commission (CENI), Corneille Nangaa, announces the victory of Fatshi, before the confirmation of this result by the Constitutional Court. During his investiture, it is still the head of the Kenyan State who will be the only crowned head of the African continent who will come to answer the invitation of the new elected. Accompanied by his former opponent Raila Odinga, Uhuru Kenyatta came almost to bolster the former opponent who became President, during the first peaceful and civilized transfer of power between an incoming and an outgoing power. It is almost this logic of national reconciliation that animated outgoing President Joseph Kabila on the eve of the election campaign.